What is the role of energy in our world? Electricity in circuits can be transformed into light, heat, sound and magnetic effects. Describe how batteries and wires can transfer energy to light a light bulb. GRADE-LEVEL CONCEPT 1:  Electricity in circuits can be transformed into light, heat, sound and magnetic effects. Electric current flows (is transferred) from an energy source (a cell or a battery) through a continuous loop (circuit) and back to the source. A complete circuit (also called a closed circuit) forms a closed loop that allows electric current to flow; an incomplete circuit (also called an open circuit) has a break in the loop that prevents the flow of electric current. Complete series circuits can be made by connecting wires, batteries and bulbs in certain sequences. Circuits are completed only when certain parts of a battery, a bulb or a wire are touching (making contact). Circuit diagrams show the relative positions of batteries, bulbs and wires in complete circuits. Conductors are materials that allow electric current to flow through them in an electric circuit. An open circuit can be completed by inserting a conductive material. If a bulb lights after an object made of certain material is added to the electric circuit, then the material is a conductor. Insulators are materials that do not allow electric current to flow through them in an electric circuit. If a bulb does not stay lit when an object is added to an electric circuit, the material is an insulator. Some materials conduct electricity better than others. Materials that resist the flow of electriThe base of a light bulb is a good conductor, but the filament wire inside the bulb is not. When electric current, some of it is changed (transformed) into light and heat. Adding batteries or bulbs to a circuit can produce observable changes. Electricity flowing through an electrical circuit produces magnetic effects around the wires. The electromagnet can be turned on and off, and its strength can be varied and measured. GRADE-LEVEL CONCEPT 2: Magnets can make objects move without direct contact between the object and the magnet. Magnets pull objects that are made of certain metals, such as iron. Materials can be sorted based on their attraction to a magnet, and mixtures of magnetic and nonmagnetic materials can be separated using magnets. Magnets have areas called “poles” where the magnet’s pulling force is strongest. A magnet’s poles are often referred to as “north” and “south.” The strength of a magnet’s attractive force can be measured by recording the number or mass of the objects it attracts or the distance across which it attracts objects. Magnetic force can travel across space and through various materials. Magnetism can be a pushing or pulling force. When the north poles of two magnets are placed near each other, they push away from (repel) each other; when the south poles of two magnets are placed near each other, they repel also. When a north pole of one magnet is placed near the south pole of another magnet, they pull toward (attract) each other. When a bar magnet, such as a compass needle, is allowed to swing freely, its ends will point toward the earth’s magnetic north and south poles. Magnets have many uses in everyday life. Examples include paper clip containers, refrigerator doors, shower curtain weights, or a compass. Charge: An electrical charge is a piece of electricity. It is so small you can not see it. When lots of charges move through a circuit you can see the effect. Charges can go from a battery through a light bulb and back to the battery again, this is what makes the light bulb glow. Circuit: a circuit is a closed loop. If you walk around a car or building and get back to where you started from, then you have completed a circuit. An electric circuit works only when it is complete, or closed. An electric circuit that has a gap so that it does not complete a loop will not work. Conductors: are objects made of materials that conduct, or transfer, electrical energy from one place to another. To transfer electrical energy from a battery we use conducting wires that are made out of metal. Metals conduct electricity. For a conductor to work we need to complete a circuit so that the electric charges can get back to where they started. These charges can be sent around the circuit again and again. Energy: is an amount of activity in things. Or, it is the amount that is stored ready to make activity. A battery has energy stored in it. This energy can be turned into heat, light, motion, and sound. Turning energy from one form to another is called transforming. A flashlight transforms energy in the battery into heat and light in the bulb. Magnets: Magnets can pull many objects towards them. Sometimes magnets can push objects away. If two objects push away from each other then they are both magnets. If you turn one magnet you can make it change from pushing another magnet to pulling it. Magnets can produce attractive (pulling) forces, or repulsive (pushing) forces. Magnets can be used to make electricity, and electricity can be used to make magnets (called Electro-magnets). Potential Energy: is stored energy. A mass that might fall, a wound or compressed spring, a stretched rubber band, a battery, a banana, and candle wax all have stored, or ‘potential’ energy. Power: is the rate at which energy is used. The amount of energy in a battery is fixed. This same amount could be released quickly, at high power, or more slowly, at low power. A powerful sports car engine converts energy from gasoline in a shorter amount of time than a less powerful engine, such as a lawn mower engine. Speed is a measure of how quickly something changes its position. Speed is an indication of the energy a moving object has. To make a heavy object move fast requires a lot of energy. Electric cars have very big batteries. Transfer: Energy can be transferred from one place to another. Light in the bulb is transferred to the wall when a flashlight is pointed at the wall. The energy that was transferred, or moved, is still in the form of light energy. Conducting materials are good at transferring electrical energy from one place to another. Transform: Energy can be transformed from one form to another. Energy in moving water can be transformed into electrical energy. Electrical energy can be transformed into motion in electric cars. Electrical energy can be transformed into sound energy in a loud speaker. When electrical energy pushes something then it does work, and work = Force x Distance. Work: is how much energy we put into changing an object’s motion. Work is equal to the size of the force multiplied by the distance pushed. W=FxD. Electric motors do work as they transform electrical energy into energy of movement. 4.4 – Electrical and magnetic energy can be transferred and transformed. Electricity in circuits can be transformed into light. Inquiry: In this inquiry, students will explore how electricity works to light a bulb. They will try to get the energy in the battery to transform into light energy coming from the bulb. They will make an electrical circuit and explore how it works. What was always the same when the light bulbs lit? Why do you think it is important that electricity travel from the battery to the light bulb in a circuit? Why do you think it is important that interstate highways have lanes going in both directions? What makes the light bulb glow? Science Concepts: Electrical charges can go from a battery through a light bulb and back to the battery again. The movement of electrical charges through the bulb makes the light bulb glow. Without a path to return to the battery, a few of the charges would pile up at the bulb, but would just sit there. 2. Explain how electricity flows through a circuit. Use scientific terminology in your response. Electric charges (electrons) move making a current. They move because they are driven by voltage. They can not jump gaps of air or other insulators and need a complete closed circuit to go around. Electricity in circuits can be transformed into sound. Inquiry: In this inquiry lesson, students will try to keep the balls going in a circuit by passing balls from hand to hand in a circle. Part of the circuit will be at a higher level (on the table top) and part will be at a lower level (on the floor). One student, who represents the “light bulb”, will call out the word ‘light’ when he/she receives a ball at table height and lowers it to the floor. The students will try to keep the bulb lit by continually feeding balls to the light bulb student. This is an exploration of the concept of circuit. Noise (light) can only be made when there is a circuit. If one student breaks the circuit, the bulb student will soon stop receiving balls and will stop saying ‘light’. Procedures and Directions: Have students sit in a circle around a table each with one ball each and ready to pass the balls around the table from hand to hand. Have one student be the ‘light bulb’. The “light bulb” student must receive a ball at table height and lower it to the floor. When this light bulb student does this with one ball, he/she says ‘light’ once. Students try to keep the light bulb student saying ‘light’, ‘light’, ‘light’ by continually providing balls at table height. Balls must be passed around the table before they can be used to light the bulb again. The “circuit” in this experiment may be expanded to include many groups, or even the whole class stretching across the room. After discussing questions below, and brainstorming some ideas about the final question, have students work in groups to draw how they would accomplish the task described below in the final question. What happens to your circuit if one of you doesn’t pass a ball? Can you have more than one ball moving at one time? 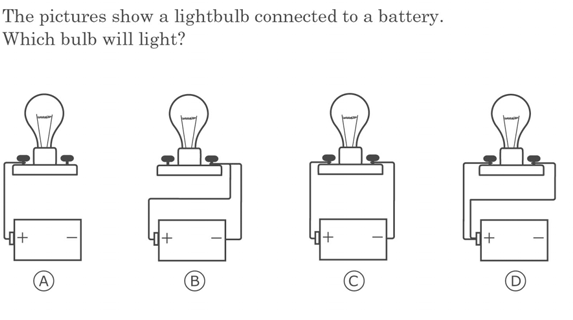 Can you have more than one ‘bulb’ in one circuit? Where is the battery in the circuit? Lifting a ball puts energy into it. Letting a ball drop lets energy out of it. So where is energy going into your circuit? Where is energy coming out of your circuit? If the whole class worked together how could we make a circuit that goes from the front of the room to make a ‘bulb’ say ‘light’ at the back of the room? Use one ball per student. Science Concepts: A circuit works only when it is complete. If it has a gap, it will not work. Set up: Take one ball each and sit in a circle around the table. Choose one of you to be the ‘light bulb’. The other students sitting at the table will pass the balls from hand to hand around the table until it reaches the “light bulb student”. The light bulb student lowers each ball that he/she receives passing it on at floor level. This light bulb student says ‘light’ as they lower the ball. Task: Keep giving the bulb student balls so that the bulb keeps making ‘light’. Rules: The only sounds that are allowed are those made from bulb student saying ‘light’. Balls must be passed either along the top of the table or along the floor. Balls must go from hand to hand; balls must not be thrown. Balls from the bulb student must go around the table before being lowered again by the light bulb student. Balls may be reused. A student (not the bulb student) may receive balls on the floor and put them onto the table. You may only pass your ball when you are receiving another one. Talk about what you did and then draw a diagram of your circuit. Work in groups to solve this problem: How can everyone in the class work together to make a human circuit that goes from the classroom door to make sound ‘light’ at the far side of the room? Use one ball per student. Draw a diagram showing how your circuit would work. The human circuit is an analogy. This is the key. Magnets can make objects move. Science Materials (for each group): 2 One and a half Volt batteries (not rechargeable), 4 bulbs, 1 fan blade, 1 electric motor, 1 paperclip, 4 wires, straw. Inquiry: In this inquiry, students will explore how different objects transform energy into different forms. Procedures and Directions: Arrange students in groups to conduct the experiment. Teachers may wish to consider assigning Task 1, and Task 2 to different groups, and then encouraging students to share what they observed and learned. All students should try Task 3. How did you decide that two circuits were different? What did you try that did not work? Why do you think it didn’t work? Does energy always “look” the same? What two little words do you see in the word “transform”? Can word study help you learn science? Science Concepts: Tasks 1 & 2 Bulbs and batteries can be put together in complex circuits. Complex in this context means not just a single loop with one bulb and one battery. If the circuit works you should still be able to trace at least one loop through at least one battery and one bulb. Task 3. Energy can be turned (transformed) into light, heat, motion, and sound. Electrical energy is moved (transferred) from one place to another through wires (conductors) in a circuit. Explain how a flashlight works. Describe what type of energy you started with and what type you ended up with, and what object transformed it. Chemical potential energy in the battery is transferred by wires to the bulb where it is transformed into both heat energy and light energy by the bulb. Describe the path the energy took going from one place (location) to another. The energy traveled along the wires, which must form a complete loop. Electrical energy can be changed into sound energy in a loud speaker. Electrical energy is ….. into sound energy in a loud speaker. Safety: The wires can get very hot. Be prepared for this, and drop the wires as soon as they begin to feel warm. Task 1: Arrange one battery and two bulbs so that both bulbs light. Do this in two ways. Make one circuit where the bulbs are less bright than they are in the other. You may use as many wires as you like when you work on this task. Task 2: Arrange two batteries and one bulb so that the bulb lights. Do this in two ways so that one circuit has the bulb dimmer than in the other. Task 3: Make a circuit that spins a motor. Now use this circuit to turn chemical energy in the battery into wind energy by spinning a fan. Then use the circuit to turn chemical energy into noise (sound) energy. Make a circuit that lights a bulb and spins a fan at the same time. Can you blow the heated air? “Go with the Flow” Embedded Task, Experiment #2 Which Materials Conduct Electricity? B 15. Explain how simple electrical circuits can be used to determine which materials conduct electricity. B 16. Describe the properties of magnets, and how they can be used to identify and separate mixtures of solid materials. Science Materials: Assorted conductors (e.g., ball bearing, aluminum foil, bag ties, paper clips, metal wire), insulators (e.g., glass marble, plastic spoon, wooden craft stick, straw, rubber band), magnets, string, compass, bulb, wires, battery. Student Handout 4.4.4a Which materials conduct electricity? Inquiry: In this inquiry, students will make an electrical circuit to test materials to see if they are conductors or insulators. They will also discover that magnets can sort out magnetic objects from objects that do not respond to a magnet. They will also discover that magnets can attract and repel other magnets. Look at your data tables. Is there anything similar about all the materials that lit the bulb? Look at your data table. Is there anything similar about the materials that did not light the bulb? Science Concepts: Materials that allow electricity to move through them easily are called conductors. Materials that do not allow electricity to move through them easily are called insulators. .Magnets can pull on some objects. Magnets can both pull (attract) and push (repel) other magnets. The north pole of one magnet repels the north pole of another magnet; a magnet’s north pole attracts the other magnet’s south pole. Opposites attract; the same poles repel each other. Lesson 4.4.4 Which Materials Conduct Electricity? Explain how you could make a circuit to test whether or not an object conducts electricity. You have available a battery, three wires, and a light bulb. Draw a diagram to show how you would design the circuit and where you would put the object to be tested. This circuit must be closed except for one gap, the gap is where the tested objects will go. Which of the following is NOT a conductor of electricity? Answer is C, figs 1 and 4 have like poles together, they will repel. Handout 4.4.4 page 1/3	Which materials conduct electricity? Task 1: Look at, feel, smell, and listen to the other objects from your pack. Make predictions about whether or not they will allow electricity to pass through them so that it can light the bulb. Record your predictions in the table below. Your teacher might let you use some other objects from around the classroom. Word Bank: spherical shiny glass marble: spherical shiny dense steel ball bearing: flat silvery aluminum foil: plastic knife fork or spoon: paper covered metal bag ties: thin flat wooden craft stick: drinking straw: rubber band: paper clips: metal wire: magnets: small round clear fronted compass: battery. Handout 4.4.4 page 2/3	Which materials conduct electricity? Did it light the bulb? Was it attracted by the magnet? Task 4: Test the same objects, this time with magnets. Complete the third column of the data table above to identify which objects were attracted by a force from the magnet. Now, analyze your data tables and place the materials you tested in the correct category. Task 5: Take two of the permanent magnets, with the ends labeled N and S. Show that magnets can both push and pull. Draw two diagrams to show magnets pushing and pulling each other. Be sure to show the N and S in your diagrams. Electricity in circuits can be transformed into magnetic effects. B 16. Describe the properties of magnets. Inquiry: In this inquiry, students will turn wire into a magnet by winding the wire around a pen to make tiny coils and running an electric current through the coils. They will then test the coils’ magnetic properties by trying to move the hands of a compass with the coils (electro-magnet). Procedures and Directions: Remind students that a magnet can move the hands of a compass. Demonstrate, using a magnet (or two compasses) to move the compass hands. Then hold a wire over the compass and show students that the hands are not moving. Ask if the wire has magnetic properties (no, because it does not move the compass hands.) Introduce the task by telling students that they will discover how to turn the wire into a magnet. 1. Does it matter which way you hold the coils? 2. Is the coil a magnet when the battery is removed from the circuit? 3. Can power lines generate electromagnetic fields? 5. How can you turn wire into a magnet? Science Concepts: Magnetic fields are caused by electric currents. Electricity and magnetism are different aspects of one complicated phenomenon ‘Electro-Magnetism’. Electricity can turn a wire into a magnet and magnets can generate electricity. The students need only get the electricity to magnetism part. Electro-magnets are used to turn motors and to make sound in many loudspeakers. Design an experiment to prove that electricity can produce a magnetic force. The current in a single wire near a compass or other sensitive magnet will produce a force, by winding loops of wire together this force is increased by the additional turns. NOTICE it is the CURRENT not the wire that is making the magnetic force. 2. Which of the following has magnetic properties? Task 1: One loop or turn of wire will make a tiny little magnet when the current runs through it. Use the wire to make a set of 40 coils on your pencil. Leave about 20cm free and then wind 40 coils onto your pencil. Push them under the clip to keep them tight. Try to move the compass needle a little bit with the set of coils. Put the ends of your wire onto the two ends of your battery. Can you move the compass needle now? Use only one compass. Rules: Do not touch or bump the compass. Watch for small movements of the compass needle. Task 2: Keep all your coils together to get the most movement of the compass needle. Break the circuit by taking one end of the wire off the battery. Task 3: Connect the wire back to the battery and watch the motion of the compass. Take away thirty coils to leave 10 coils. See how much you can move the compass. Take away another nine coils to leave 1 coil. See how much it can move the compass. Complete the data table for Electromagnetism. The direction, but not the size of the force on the compass will change (switch direction). ………………………………………………………………………………………….